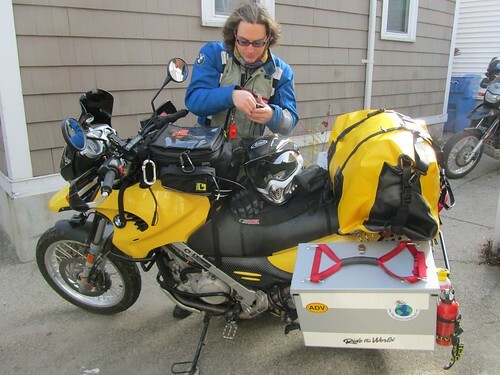 Motorcycle trips always seem to take longer than you expect to prep, and a 4-month trip over 20,000 miles warrants the extra time. We’d done as much as possible to get ready to go before the big day came, but there was still a lot we had to do the morning of to get the house and dogs ready for the house/dog-sitter, and get us ready for the road. We had some last-minute packing to do, and a few last-minute scores of things we thought we’d forgotten and had to unpack and then re-pack to check. Long story short, we didn’t get on the road until after 11AM, and didn’t hit the interstate (where we’ll be spending much of our time in the U.S.) until close to noon. We quickly discovered that Kay’s bike needed some adjustment. The bike was initially having speed wobbles at 65mph. 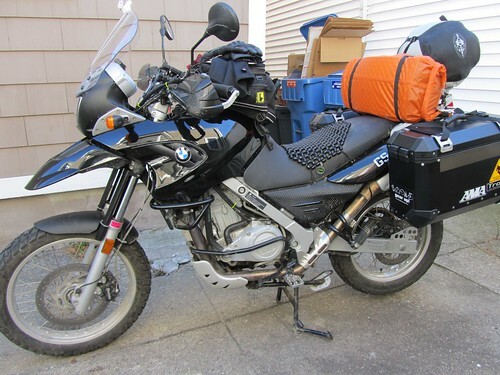 We’d put new chains on the bikes, and added a dry sack duffle to the back of Kay’s bike, but otherwise hadn’t changed the configuration so the wobbles were a mystery. We only got about 15 or 20 miles from Boston before we had to pull off at a service area to check out the bike. A quick Web search later and we adjusted the pre-load on the front suspension, checked the alignment, checked tire pressures and decided to hit the road again. Cranking up the pre-load helped immensely, but the bike was still wobbling a bit around 70mph and it was decided to stop again before we hit I-84 into Connecticut. We hit another service area just a few miles before the exit, and cranked up the pre-load and added a bit of air to the tires. Of course, the bike was on a slant and when Kay stepped off of it it fell right over. Checking underneath before lifting it revealed that no, the kick-stand hadn’t done anything wrong. The bike had simply pivoted on it when it went over. When we got back to the interstate, the bike was riding well. Pre-load and air had done the trick. By this point it was past lunch time, and we’d been riding in the cold, so we planned to stop at Traveler’s Books and Food in Connecticut. We didn’t realize how close it was to the Massachusetts border and reached it far sooner than expected. 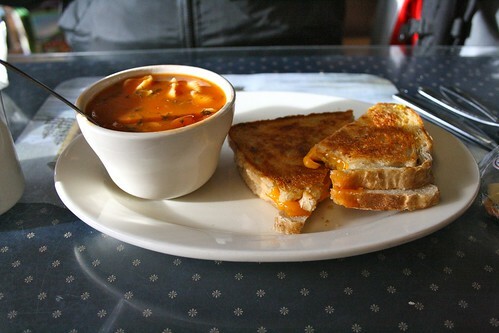 Had a tasty lunch, and I got the most amazing grilled cheese and tomato soup combo I’ve had in my life. Seriously. Truly heavenly. If you’re in the area, stop there and eat. We managed to get about an hour and a half down the road before we had to stop again. It was time to gas up, and we were getting close to New York City during rush hour, so I decided I’d like a bathroom before we tried to tackle any of NYC’s notoriously traffic-y bridges. The first gas station we hit was a dud, so we rode on until we found a Stop N’ Shop gas station. While removing the helmet, however, Kay’s glasses secretly lept from the tank-bag, and, leaning forwards to set down the helmet, they were crushed underfoot in a way that looked impossible to repair. At this point, it was around 4:30PM and already getting dark. The temperature was around 35 degrees and Kay effectively had no glasses (and needs them to drive). Back-up glasses, you say? Kay doesn’t have any – the plan is to grab some when we hit a border town in Mexico. We were mulling over our options when a guy at the next pump in the gas station heard us talking about the divey looking hotel we’d passed and recommended one just down the road. He said it was cheap but clean, and that’s how we ended up at Shoreline Motel in Milford, CT with the sun setting at 4:30 on a Tuesday. We only made it 160 miles from home on our first day, but between getting out late, diagnosing bike troubles and broken glasses, there’s not much we could do about it. We prefer not to ride at night anytime, and with the cold it’s really quite dangerous to ride at night, even with our heated gear. We immediately exploded our gear all over the (cheap) hotel room and pulled out the JB Plastic Weld that I remembered we’d brought. 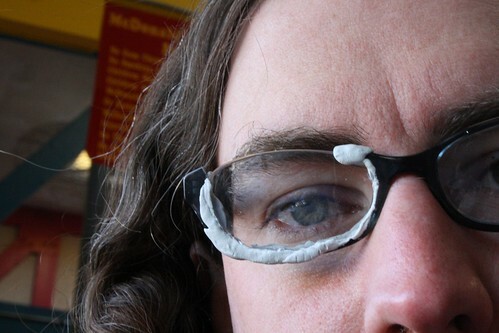 Kay went to work fixing glasses while I called around on my never-ending quest to find some Michelin Anakee 2 tires for my bike. A few hours and some Domino’s delivery later, we’re fed and warm, have fixed the glasses, have located some tires for me in Louisiana, and I actually managed to get some work done, too. With one black rim and one white JB Weld rim the glasses look like a reject project from some 1980’s video though. Not how I’d have planned our first day, but not horrible. Tomorrow (Wednesday) we’ll try to hit the road earlier (and find some wi-fi so I can send my work off to a client and post stuff to the site for the ride report) and cover some miles. The immediate goal is to put the Great Cold North behind us – the sooner, the better!